DVLA registered. Excellent Original Condition, with original documentation. DVLA computerized the old-style logbooks in 1983. Vehicle owners were asked to submit their old-style logbooks. Unfortunately, without any advance warning, DVLA callously destroyed nearly all of the original documents. 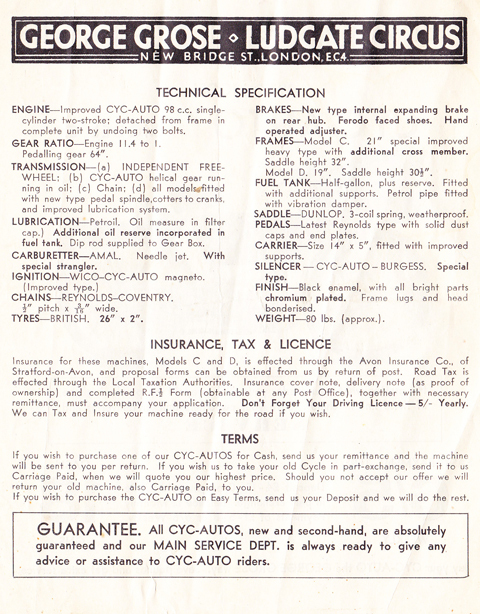 So though most vintage cyclemotors often have a current DVLA document, it’s rare to find the original papers. Luckily this Jagrose still has its 1951 logbook and various other original documentation. 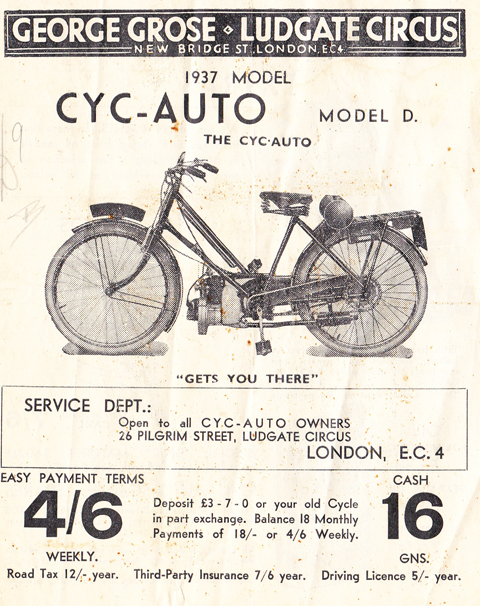 This Cyclemaster was purchased by Mrs Violet May Ward, of Pinner, Middlesex on 15th September 1951, from James Grose Ltd for £29 19/- 3d. Various original documentation can be seen further down the page. There’s the original logbook, and various insurance certificates and receipts from the motor tax dept relating to the above owner, dated 1956. I’ve owned this machine since 2005. I actually sold it in 2006, MOT’d and taxed and ready to use. But the purchaser never collected it! He can be excused though, as he lives in Argentina. I enjoy communicating with fellow enthusiasts around the world and we became email pen-pals. He invited me to visit him, with the Cyclemaster in my luggage, a proposal I did seriously consider; the arrival of our baby daughter the following year put travel plans on hold however. After storing it for three years, I refunded him in March 2010. I then had it serviced and MOT’d. It has always started easily and run well. Recently, someone else almost bought it: well, they wanted the engine as a spare. I was just about to remove it, but another restored Cyclemaster was offered to me at the last minute so I sold them that instead. I do have other, more ‘exciting’ Cyclemasters. But, by now, I’ve become quite attached to this machine. I’m sure fellow collectors experience similar emotions and dilemmas: where do our collections end and our businesses begin? Grose bicycles are now very rare, and this one is in excellent original condition, with – as you can see above – its transfers very well-preserved. The machine is, in all respects, a very good original example, cosmetically unrestored. 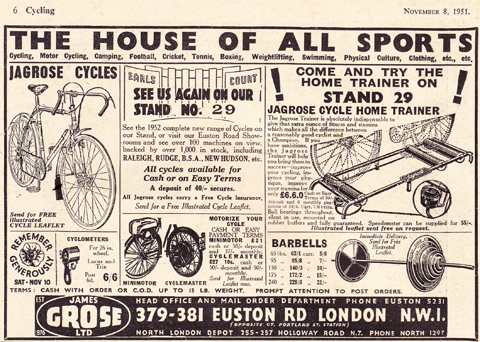 James Grose put their own badges onto bicycles supplied to them by other well-known manufacturers (a common practice). 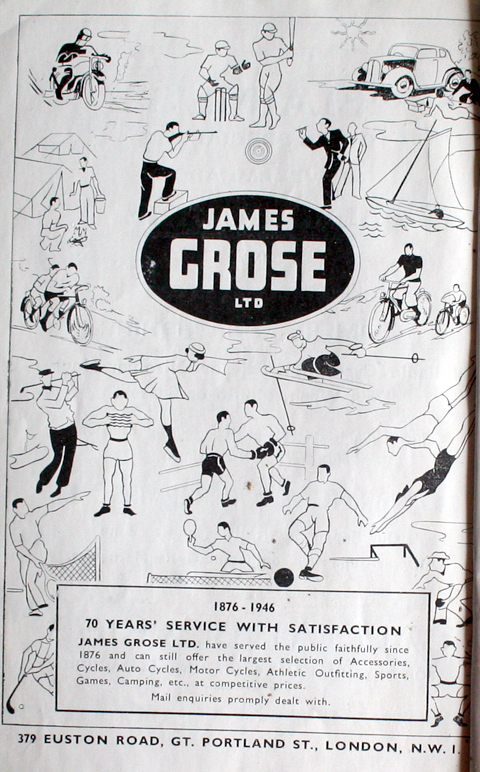 The badge name for cycles supplied by James Grose Ltd was Jagrose. 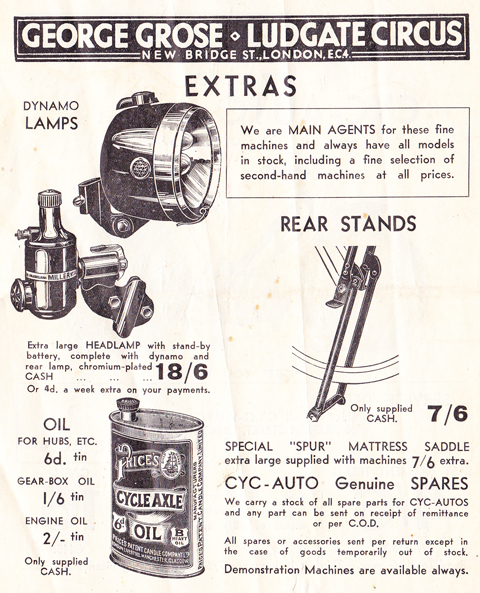 When the Cyclemaster was launched in 1951, Grose also started supplying cyclemotors for customer to fit themselves. 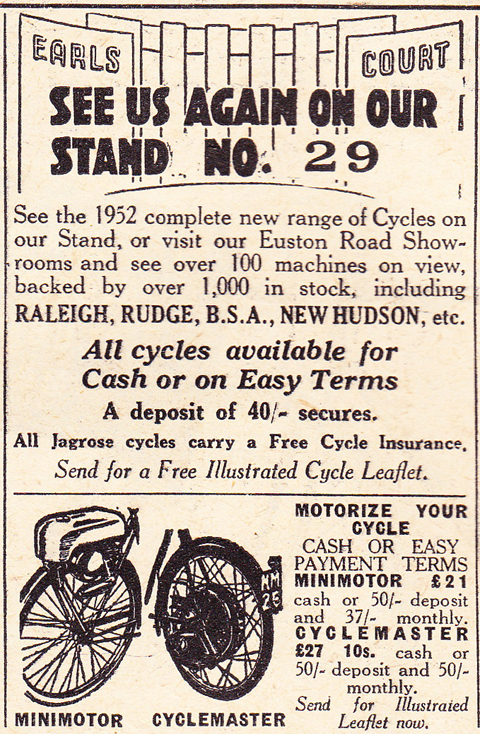 This advert illustrates a Cyclemaster at £27 10/- and Minimotor for £21. Or you could purchase one with the engine already fitted, as in the example presented here. It’s also easy to start by running a short distance with it and lifting the rear wheel. I used to restore classic cars in 2006, and you can see the Cyclemaster, above, leaning on the 1951 Austin A90 Atlantic that I sold soon after: two 1951 vehicles very much at opposite ends of the motoring spectrum. The bicycle looks very similar to the George Grose & Co Spur Model S1 in the catalogue below, so I’ve included the George Grose catalogue for reference. 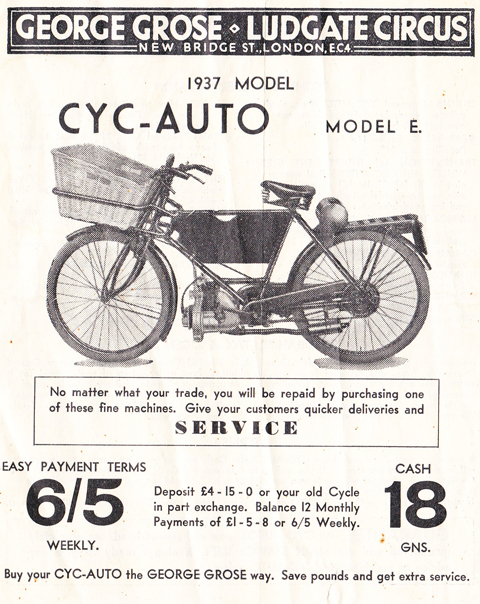 The Spur bicycle is designated Model S1L, offered at the bargain price of 55/- or 24 fortnightly payments of £2 10/- which made it Grose’s cheapest bicycle. Only the Gents model S1 is illustrated in the Grose catalogue though, as you can see below.